S. J. Clarkson is a British television director. Clarkson's credits include the series Doctors, Casualty, EastEnders, Footballers' Wives, and Life on Mars, as well as the American series Heroes, House, Dexter, and Ugly Betty. 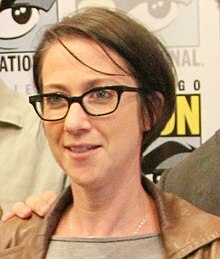 In 2008, she co-created the British series Mistresses. In 2010, she also directed the film Toast. In 2019, she signed on to direct the Game of Thrones prequel for HBO. 2009–10 Heroes Episodes: "Hysterical Blindness"
2009–11 Dexter Episodes: "Hello, Dexter Morgan"
2010 Ugly Betty Episode: "The Passion of the Betty"
2011 House Episode: "Recession Proof"
2013 Bates Motel Episode: "The Man in Number 9"
2013 The Bridge Episode: "All About Eva"
2014 Turn: Washington's Spies Episode: "Of Cabbages and Kings"
2014 Orange Is the New Black Episode: "40 Oz. of Furlough"
2016 Vinyl Episode: "The Racket"
^ Otterson, Joe; Otterson, Joe (2019-01-08). "'Game of Thrones' Prequel Rounds Out Main Cast, SJ Clarkson to Direct". Variety. Retrieved 2019-01-08. This page was last edited on 10 February 2019, at 22:16 (UTC).